Odd that todays beer also has a ram or two on the label. I think that is two beers in a week where both of the labels had those pesky rams displayed. That must mean something…no? 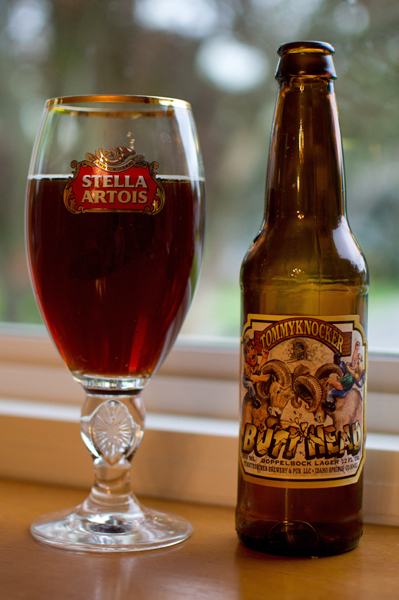 Anyways todays beer, #157, is Butthead by Tommyknocker Brewery. Butthead? OK…where is Beavis or Cornholio? This fine brew from Idaho Springs, Colorado is a Doppelbock with an ABV of 8.2%. This beer had a brown color with some nice ruby red colors when held up to the light. The head was forgettable (shame)…was it even there??? To the nose it went and a roasted sweet caramel malt aroma is instantly recognizable. 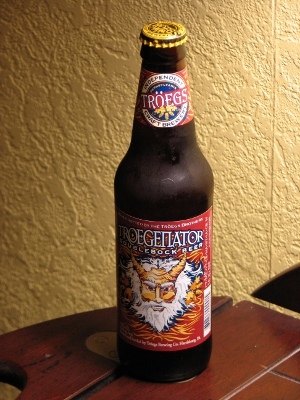 According to the label, this brew uses crystal malts and those are responsible for that caramel sweetness in the nose. I also got a bit of grain…think bread…nice warm fresh from the oven bread. The sweet (but not overly) caramel dominates the taste with a hint of hops which were slightly bitter almost fruity but the heavy malts made it hard for me to identify that fruitiness. There was also a touch of that alcohol warmth which became a bit more noticeable as it warmed up. It was closer to thick than medium body wise with a slightly syrupy consistency. The carbonation was on the low side. Easy to drink but take your time as that ABV has a way of sneaking up on you…at least it did for me. Solid…that is the best way to describe this. It was a nice beer to end a very hectic day. I knew I shouldn’t have made fun of Old Man Winter yesterday. He retaliated by sending a bit of that white stuff on this cold, raw, gray day. 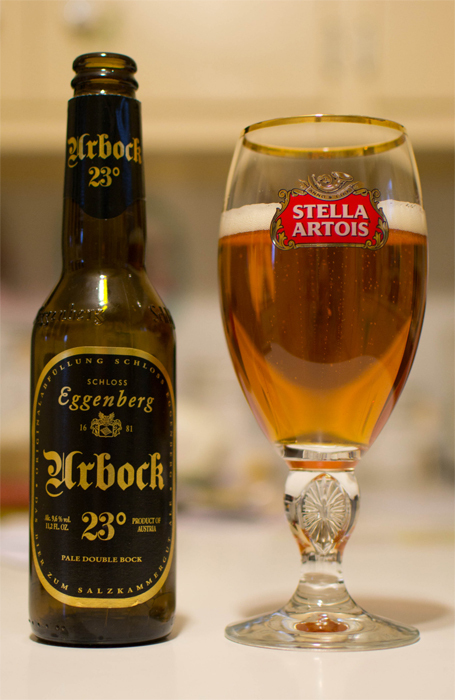 I poured Urbock 23 into a Stella Artois glass I received from fellow beer blogger, Cavie, http://cavalierbeer.wordpress.com/. A clear amber with just a tiny head stared back at me from the glass. To the nose it went and a very malty brew did I smell. The alcohol was also noticeable along with a fruity, apple like scent. I took a sip and the malts from the nose come across sort of sweet and bready. I didn’t get any of the fruitiness I smelled but the alcohol is there right at the end of the sip with a nice warming sensation. Medium bodied and fairly low carbonation, this was a sipper for sure…one thing I did notice is the warmer it got, the stronger the fruity apple aroma got and the more the alcohol made itself known. Not bad and I can see why on the label it says it is known as “Cognac of beers” as at times it seemed like I was drinking liquor rather than a beer. Thanks again to Cavie (visit his site if you haven’t already) for the Stella glass and please pardon me using it for something other than Stella, which this beer is far better.